Central Turf & Irrigation Supply, a North American wholesale distributor of landscape supplies, unveiled its Organic Insect Control for summertime pests. Organic Insect Control has an all-organic formula that will not harm beneficial insects like bees, butterflies and earthworms but will eliminate ticks, mosquitoes and other insects, according to the company. The product can be applied with a traditional sprayer or can be used with a fogger device. 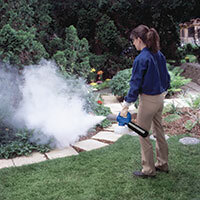 Central offers a fogger that operates from a propane tank for use in patio and deck areas. The organic insect control is sold in a 32-ounce bottle that treats up to 5,000 square feet.